The INOGENI HDMI/DVI-D to USB 3.0 Converter is the most easy and reliable tool to capture uncompressed video with audio from your camera's HDMI/DVI-D output for your PC for recording, video conferencing and live streaming applications. 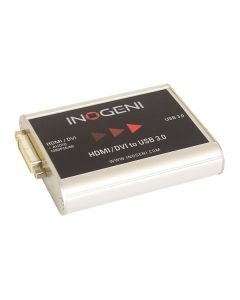 The INOGENI HDMI/DVI-D to USB 3.0 Converter is the most easy and reliable tool to capture uncompressed video with audio from your camera's HDMI/DVI-D output for your PC for recording, video conferencing and live streaming applications. No driver installation is necessary and will work on all motherboards and USB 3.0 chipsets. It features a single HDMI/DVI-D input and USB 3.0 output, supports SD / HDTV video formats up to 1080p60 and most computer graphic formats. Compact in size and powered directly from a USB 3.0 port, the converter is a practical and easy-to-use USB 3.0 capture solution. Compatible with Windows, Mac OSX, Linux, and Android operating systems and UVC-compliant, so it will work with all DirectShow compatible software. The converter supports 1080p resolutions up to 60 fps. All SD / HD resolution signals are converted to 4:2:2 8-bit colour space over USB 3.0. The embedded audio in your HDMI signals are extracted and output as two-channel LPCM.